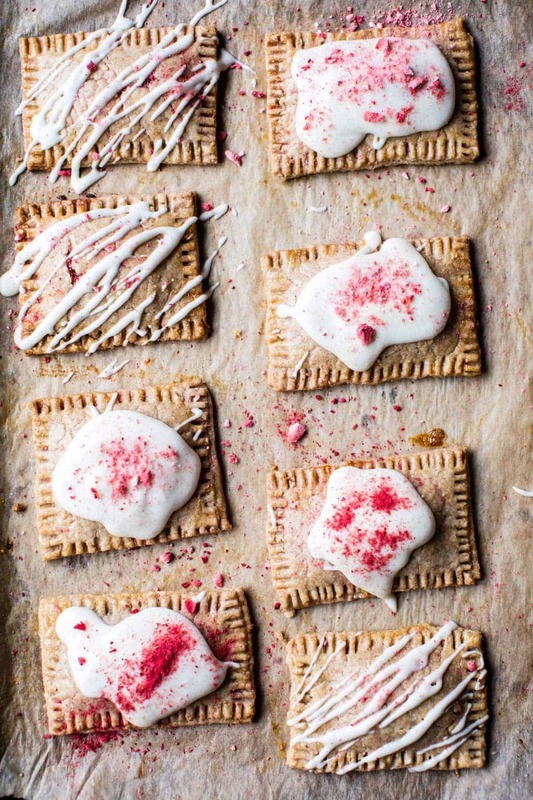 I think our Tuesday could use a sweet, buttery pop-tart. 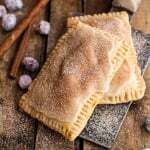 Pretty sure it’s no secret that here on Half Baked Harvest we love a good homemade pop-tart. Let’s take a walk down memory lane, shall we? First up was the most perfect (literally) homemade chocolate fudge pop-tarts (I think I need to reshoot these photos…mainly because I want an excuse to bake these up again). Then I made these fun cinnamon sugar nutella swirled pumpkin pie pop-tarts. Then, I mean, as if those two were not enough, I made these chocolate peanut butter fudge pop-tarts. So yes, I like my homemade pop-tarts, and apparently I like them really chocolately…understandably so. 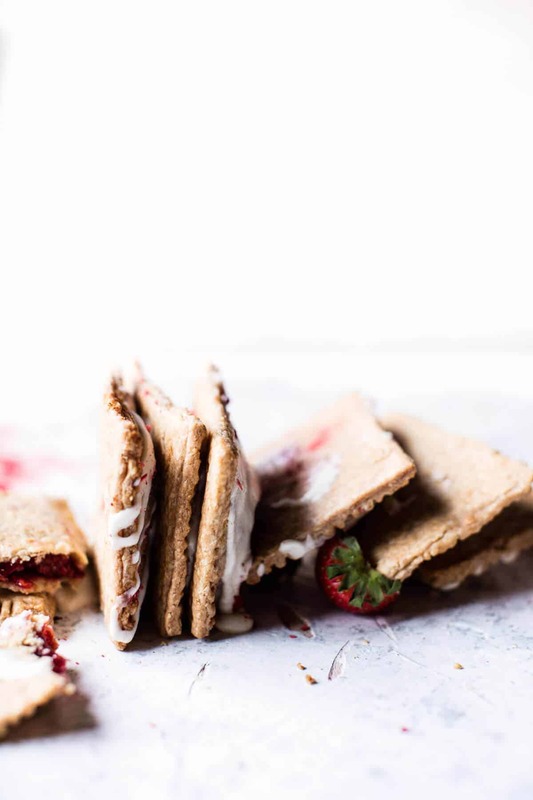 Today’s pop-tart has nothing to do with chocolate and everything to do with strawberries!! Ahhh oops, shoot, I guess I did use a little white chocolate, huh? Hmmmm…does that count as chocolate? Not in my book, but I guess it is chocolate. Oh well, I think you guys get what I am saying. These are mainly fruit filled pop-tarts and I love them. Spring is quickly approaching and I am really starting to crave bright spring colors, flavors…and flowers. Anyone else love spring flowers? I have always loved a beautiful floral arrangement, but around here the best we get are roses, tulips and hydrangea. I’m longing for those gorgeous peonies I see all over Pinterest. If you guys follow my FLOWERS board, you can get a pretty good idea of what I love. Sadly I can’t find any of those flowers up here in the mountains. Maybe I can get my brother Kai, who lives in LA, to bring some back? Right…that’s never going to happen. Question: what’s your favorite spring flower? Anyway! Pop-tarts! I know it’s not quite strawberry season yet, but I got a little too excited the other day when I saw some deep red strawberries in the grocery store. 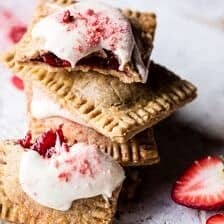 I have been wanting to make homemade strawberries pop-tarts for the longest time, so I decided to just go for it. Only me being me, I had to throw in another fun flavor…i.e white chocolate! 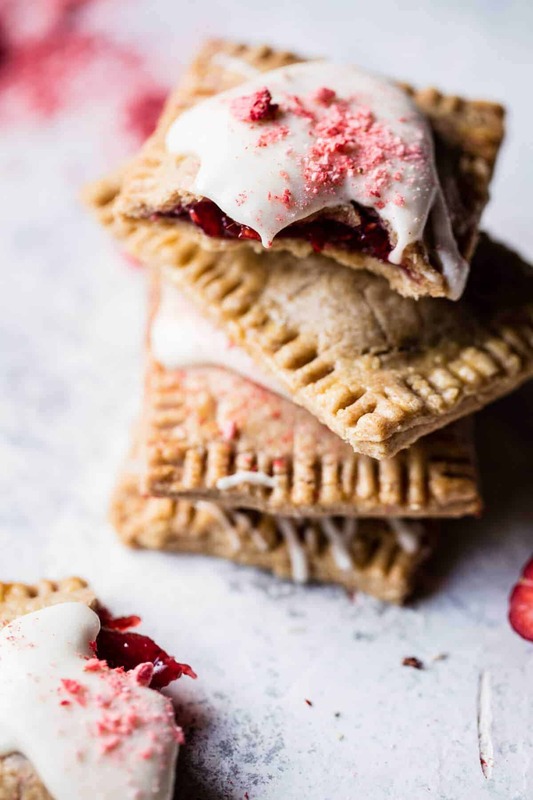 Originally, I wanted these to be super healthy pop-tarts that we could eat every morning and not feel a sugar high off of…but after rounds and rounds of testing, I decided I would go for a healthy…ish pop-tart instead. Meaning I might not eat these every single day, but more as a fun every so often breakfast! Balance and moderation, right? Yup, yup. The crust is a hearty mix of white whole wheat flour, oats and butter, got to have the butter! I love that this crust is so simple, yet so perfect. It’s soft, buttery, and flakey. All the things I love. As for the filling? I decided to do a combo of strawberries, raspberries, and honey. The honey paired with the strawberries is my favorite. I will never, ever tire of that combo. Add a squeeze of lemon, a splash of vanilla and pinch of salt to bring out all the flavors. <–FYI, this jam would be amazing for a PB & J. Just sayin’. Then comes the white chocolate part. 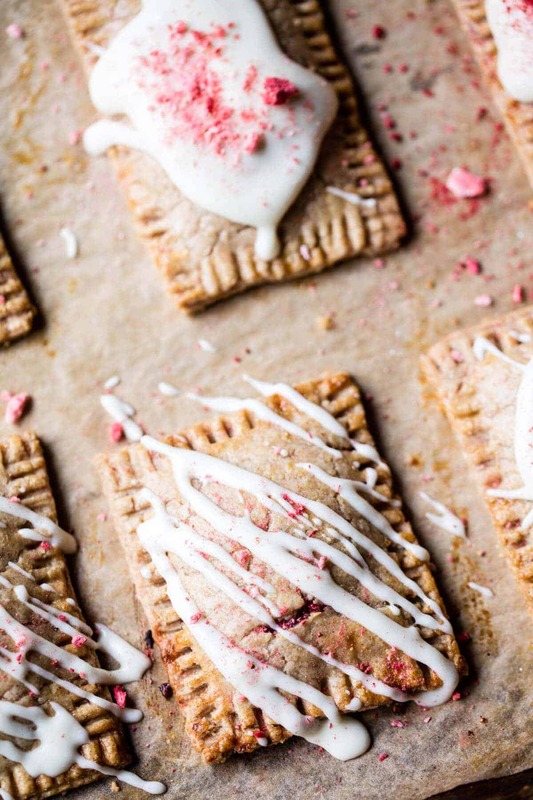 If you’d like, you can add some white chocolate chips to the middle of each pop-tart. I did this for half of mine, and yes, it’s as good as it sounds. AND then, I also stirred a little melted white chocolate into the frosting. 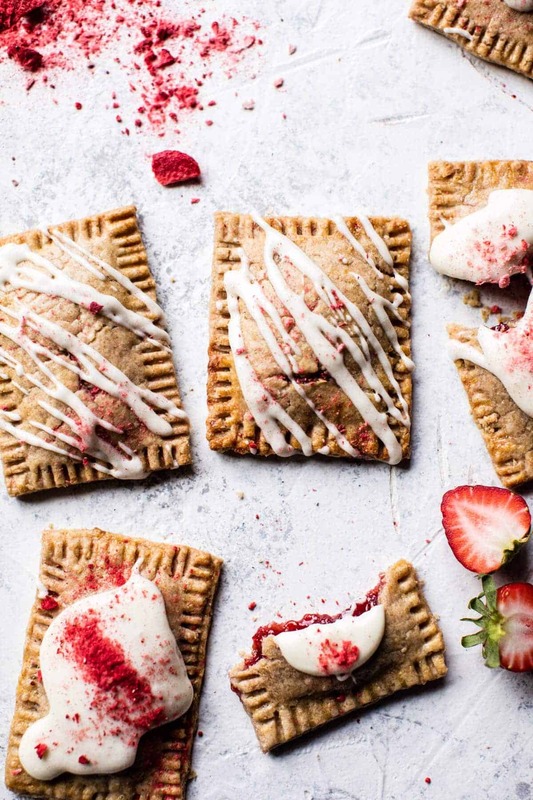 It’s the indulgent part of these pop-tarts, but it’s worth it because it is delish. So do you see now? The perfect Tuesday treat, right. Pretty easy to make, full of whole grain oats and healthy berries and topped with just a little sweetness. A homemade version of one of your favourite childhood snacks! 1. 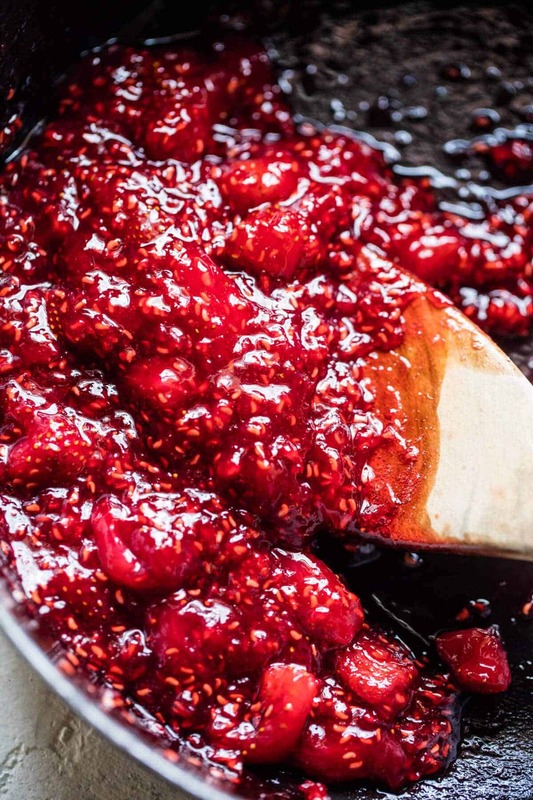 To make the strawberry jam. In a medium pot, bring the strawberries, raspberries, honey, and lemon juice to a boil. Boil 8-10 minutes or until the mixture has thickened and becomes jam-like. Stir in the vanilla and a pinch of salt. Let Cool. 2. To make the crust. In a food processor or blender, combine the flour and oats and pulse until the oats are mostly ground. Add the butter and pulse until the mix clumps together to form pea size balls. Add cold water, 1 tablespoon at a time until the dough comes together and forms a ball. 3. Turn the dough out onto a flour surface. Roll out into a 1/8-inch thickness. Cut the dough into rectangles, about 6 1/2 x 4 1/2 inches. Place a heaping tablespoon of the strawberry jam on one half of the rectangle, adding a white few chocolate chips, if desired. Lay the other half of the dough over the filling and seal the edges by crimping with the back of a fork. Repeat until you have used all the dough and jam. 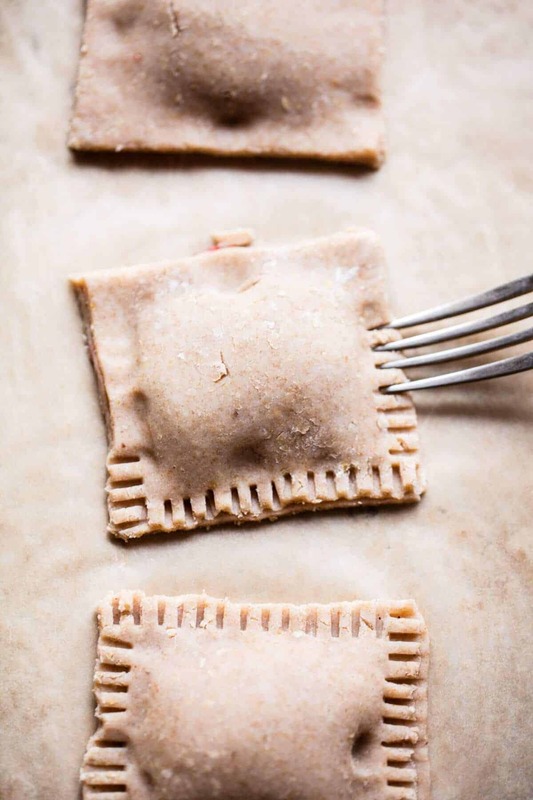 Place the pop tarts on parchment lined baking sheets. Cover the baking sheets and place in the fridge for 30 minutes to 1 hour. 5. 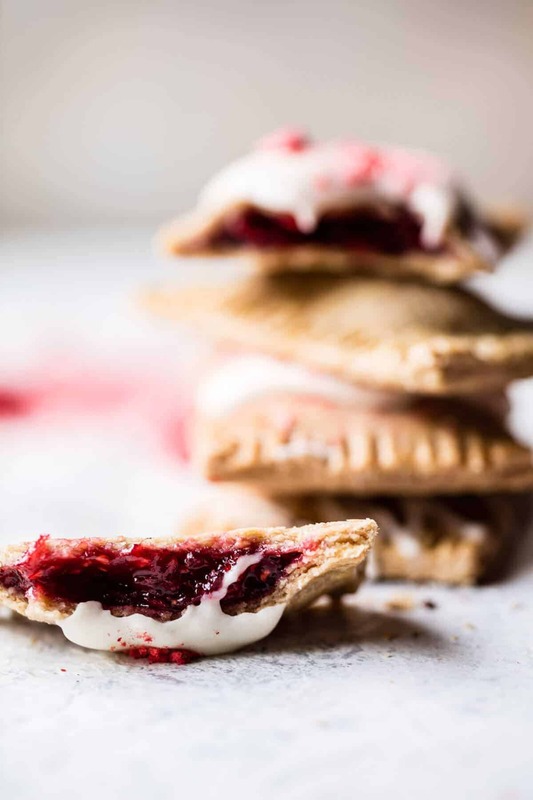 Brush the tarts with the beaten egg and bake the pop-tarts for 10 to 12 minutes. Let cool slightly. 6. 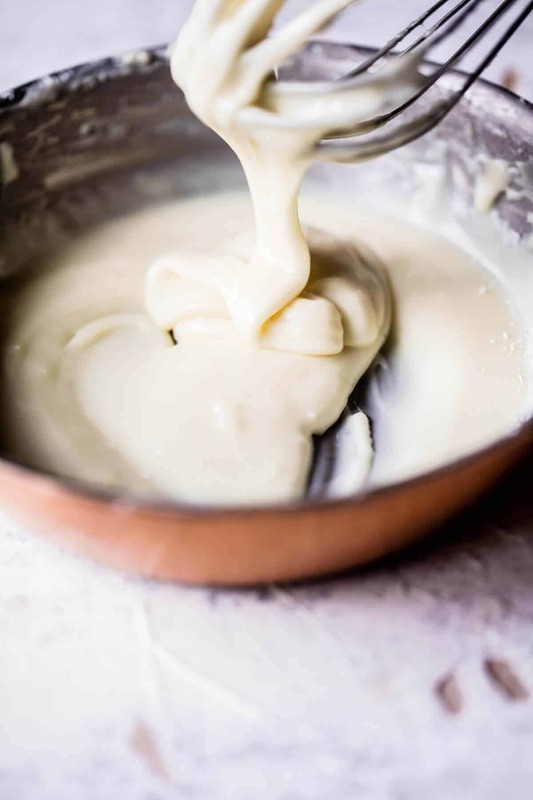 Meanwhile, in a medium bowl, whisk together the melted white chocolate, powder sugar and 2 tablespoons milk, adding extra milk to thin the glaze as desired. Drizzle the glaze over the pop tarts. Decorate as desired. White chocolate is chocolate to me (but that’s because I’m one of those rare individuals who actually prefers white chocolate over milk or dark chocolate – so sue me 😉 ). 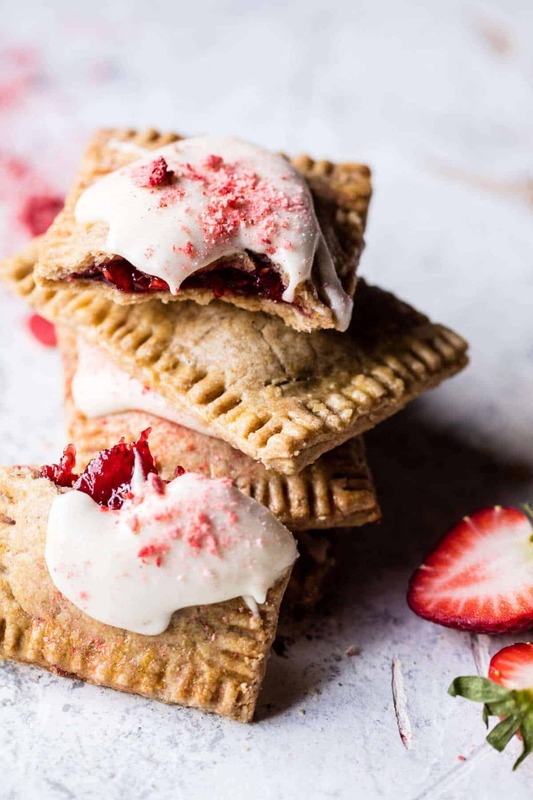 Love that you incorporated it into this homemade pop tart recipe! And yes, pop tarts are mini pies/pastries. Well you should love this one if you like white chocolate! Thanks Liz! why do you call it a cream cheese glaze? is the title a mistake or the ingredient list? thanks so much for catching this Kelli! Fortunately I saw your comment this morning and immediately changed the glaze to white chocolate glaze. Yes, this was a mistake on my part…oops! White chocolate always sounds so decadent and indulging!!! I love it. 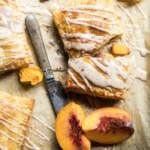 Every Tuesday should start with a buttery pop tart Tieghan! Love all your variations over the years! Wouldn’t that be the best!? Perfect post for Pi Day!! I never liked Pop Tarts, but I think I would love these. So pretty. Well I hope you enjoy them! Thanks so much hope you had a great PI day! This looks amazing! As do all your pop tart recipes. How much lemon juice should we use? Just a squeeze I believe, but wanted to double check. Thanks! So sorry! I will fix the recipe, it is the juice of half a lemon. Let me know if you questions. Hope you love these! I love the combination of strawberries and white chocolate- so yum! So happy you love these, thanks Izzy! YUM!!! 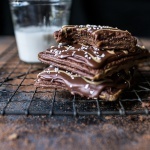 I’ve been looking for a homemade Poptart recipe to try and these look divine! Awh thats so sweet, so happy you liked that! I hope you love these pop-tarts!! Mmmmmmm………..I’m totally with you on this one, exactly what Tuesday needs! 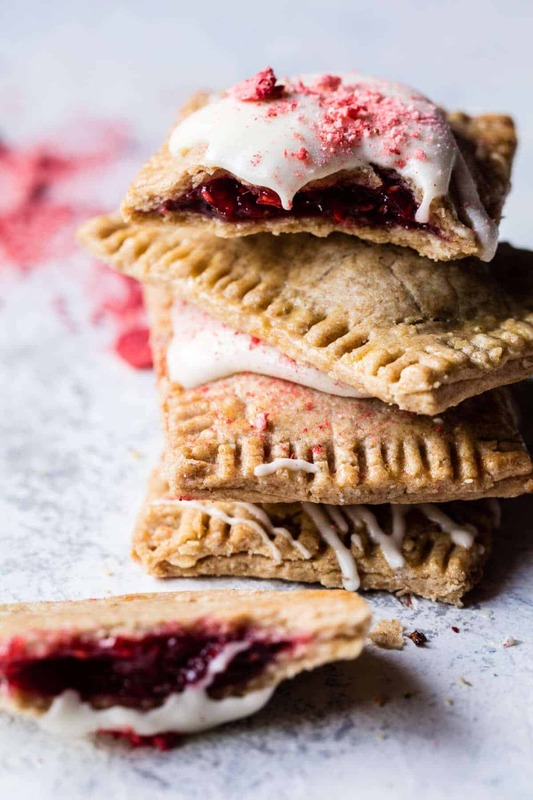 I am not a fan of super sweet conventional Poptarts….But change the name to hand-pie, and I’m in!!! YUM! Haha, these should be nothing like your conventional pop-tarts, so I hope you will love them! Yum! My fave spring flowers are tulips and violets…actually anything in bloom this time of year, including dandelions!!!! Those flowers are the prettiest! Thanks so much! This is a gorgeous looking recipe! And I love the crushed freeze dried strawberries?! So glad you are loving this, Cassandra! Thanks! I cannot wait to make these! I’m curious if you think the crust would turn out well if I used regular whole wheat flour instead of white whole wheat flour. These look amazing! Possible to make night before, leave in fridge overnight, bake off in morning? Thanks! Yes, that will work great! Hope you love these! Is the flour measurement off? I tried this tonight and they were a disaster – looking back at your other pop-tart recipes, you use 3 cups of flour compared to 1 cup here. Was that intentional? I am so sorry for the trouble! What was the issue with the dough? Thanks for the reply! It was just super super sticky, but also really small – I was only able to get 4 tarts out of it (and I don’t think my portion sizes were off?) It’s 1 cup flour 1/2 cups oats, right? OH no! It’s should be 2 cups flour. I am SO sorry. Did they still taste good I hope?? Recipe is now fixed, again, so sorry for the trouble! Ah! Thanks for the fix…I’m glad that I’m not hopeless! Does the glaze harden up at all or does it stay wet? I am going to make these to bring for dessert for a friends on Friday. A few questions! 1. Just want to clarify- regular all purpose flour will work?? 2. Should the butter be softened? 3. How big do the pop tarts end up being?? Thanks so much—always love your posts! You have done a formidable job and our entire group will probably be grateful to you. That is so great! Thank you Monique! I added a few tablespoons of sour cream to the dough, and I added 2 oz of cream cheese to the frosting ! 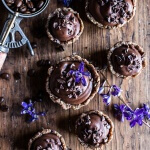 Wonderful recipes thanks for sharing!